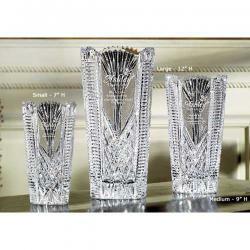 Buy Crystal Vases to give to your winners for your next golf tournament, event, or outing. 4. Your Crystal Vases will be produced and shipped followed by a tracking number sent by email. Crystal Customized Golf Vase Awards - Golf Tournament Gifts.. Custom Etched Logo Glendale Vase Cut Glass Etched Golf Awards. Hand-blown by skilled artisans, our contemporary Glendale Vase features a unique flared design with a thick, sturdy base. Available in three sizes and packaged in an attractive gift box, .. Custom Etched Logo Vantage Vase Cut Crystal Corporate Golf Awards. Our Custom Vantage Vase is a dramatic piece of hand-blown non-lead crystal designed with ample surface to showcase any corporate logo or award message. This piece employs reverse side.. Custom Logo Sullivan Trophy Vase. Our tall and impressive Exmoor Trophy is a great way to acknowledge a broad range of accomplishments. Made of fine-crafted hand-blown non-lead crystal and featuring a vase style with sleek hand-cut detailing, your elite a..
Discount Engraved Golf Award Cobalt Blue Vase. Our Engraved Golf Award Cobalt Blue Vase is designed with open panels front and back that highlight your logo and keep it from getting lost amid the cross-cut pattern. For an added touch, .. Golf Commemorative Personalized Crystal Vase Award - Golf Tournament Gifts..